We’ve been clearing out the remnants of my cousin’s* stuff after moving him into a nursing facility. If you are having trouble letting go of things, I highly recommend spending a few weeks clearing out a hoarder’s house. It makes you want to go home and throw away everything you own! But, what makes it so insidious is that, amongst all the trash and forty-year-old receipts, you sometimes find something quite interesting. My aunt* was a war bride, married while my uncle was stationed in London. 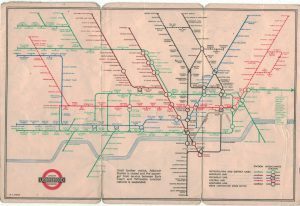 I don’t think that this underground map was a collectible per se–it was just something that was just lying around for 75+ years. What is fascinating to me is how work-a-day this is. 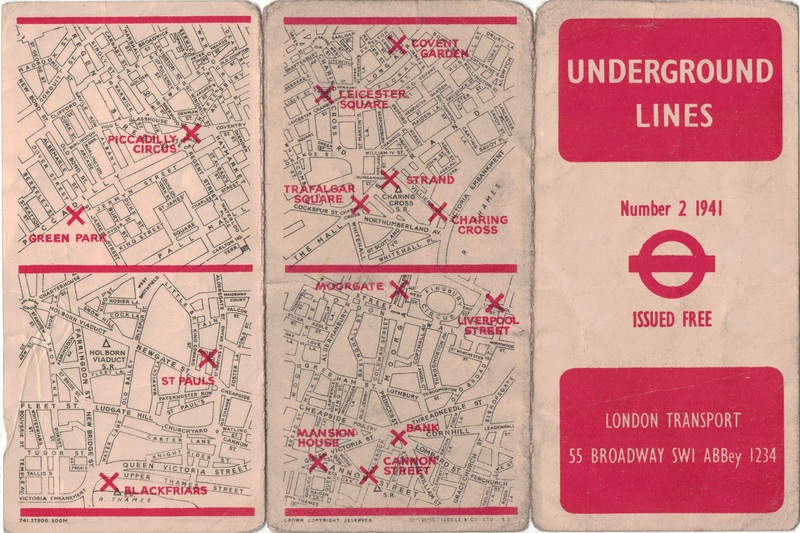 It looks very like the maps you can pick up in tube stations today, with almost no indication that the blitz was in full swing, while the tube stations were turned into nightly shelters. 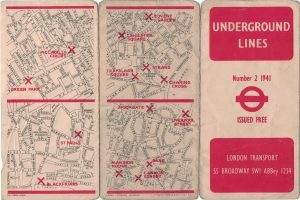 Actually, I don’t know exactly when in 1941 this map was printed–it is just labelled as “Number 2”, but the blitz ran through May, with occasional raids occurring long after that, and many people continued to shelter in the Underground throughout the war. 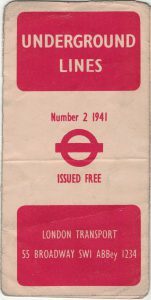 One slight indication of what was going on is the paragraph under the map that reads “Until further notice, Aldwych Station is closed and the passenger train service between Earls Court and Willesden Junction stations is suspended.” Aldwych Station was used as a repository for items from various galleries and museums. It is now a “closed” station that is often used for filming TV shows and movies. I don’t know the exact issue with Earls Court, but Willesden Junction was a major supply depot. 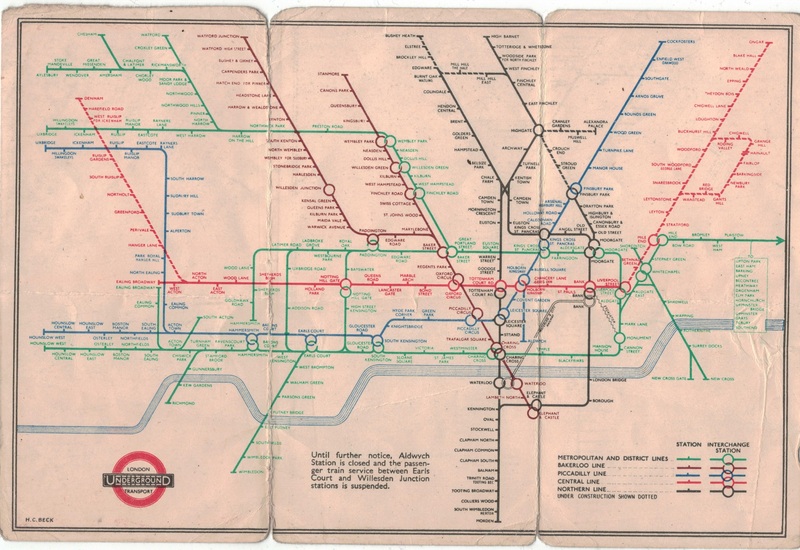 There are only 5 lines instead of the current 11 (not counting all the various overground lines shown on the modern maps). I also really like the little Olympic rings that show interchanges. I guess those were lost as the data on the map became more dense. There is no legend, but I am fairly sure that the Xs mark stations that were damaged or closed by bombs. A bit of googling shows that the listed places were all hit in late 1940/early 1941. The lack of explanation could have been because of censorship (although it is hard to see how useful that would be), or could just be standard British understatement. It is sobering either way. 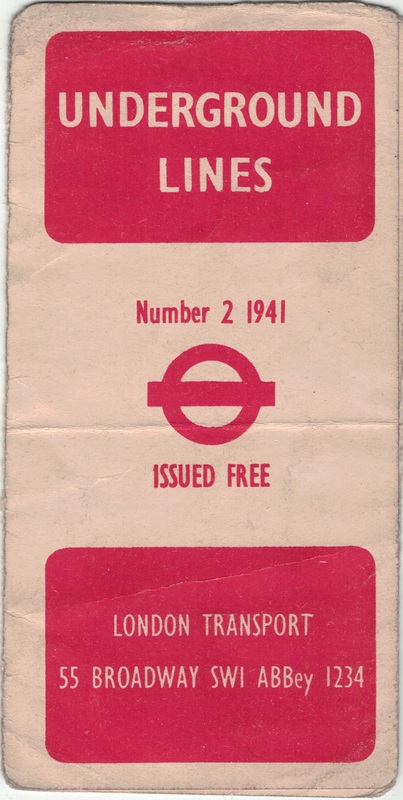 Despite all my reading, I find it hard to imagine what London was really like during the blitz, or what it would have been like to huddle in the Underground during bombing raids. I know that my Grandma and my Uncle Ray were evacuated at various times (my mother wasn’t born until 1945), but my Grandpa generally didn’t bother with shelters–which meant that my Grandma didn’t get the option. Apparently they were playing cards with some friends during a bombing raid when my Grandpa’s factory* was destroyed–they could see the fire from their house, although they originally thought it was the next-door building (which belonged to their card-playing friends). My father was just a baby at the time (he was born in 1940), but he really didn’t like sirens. I remember once when he was sleeping and a siren went off on the television. He leapt out of bed and ran to the window before fully waking up. In the 1970s, when we lived in London, I vaguely remember that there were still fenced-off bomb sites. Interesting piece! To what do the asterisks refer? In theory you are supposed to be able to float over them and get a tooltip. I think I might need a different approach!